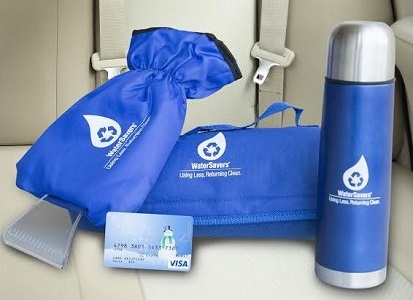 WaterSavers $30 Visa Gift Card And Winter Prize Pack Giveaway! Fine Print: I was given a prize pack and WaterSavers is giving another to a reader. All opinions and statements are my own. A clean car is your first line of defense against winter. While the winter season typically takes a toll on your car, proper maintenance can go a long way to preserving your investment. For example, according to the International Carwash Association®, getting a new wash and a fresh coat of wax before the temperature starts to fluctuate can be your first line of defense against winter elements like ice, salt, sand and slush. Rotate your tires. Most people know they should get their oil changed every 3,000 miles, but many forget their tires need maintenance as well. Tires should be rotated before winter and then again every 6,000 miles. Take care of your wiper blades. Your windshield wiper blades are your first line of defense when the snow starts to fly. Make sure your wiper blades are in good, working order and replace them if you have doubts. It’s better to make this change now instead of finding out your blades aren’t working when you really need them. Take your car in for a tune-up. Any noises, pings or sluggish starts you currently notice will only intensify as the temperature drops. It’s best to get your vehicle in for a tune-up as soon as possible to get any issues addressed. Give your steering some power. Check your powering steering fluid each month, and make sure the car is warmed up before you do so. If you find the level is low, look for leaks in the hoses or pump. Low power steering fluid will make your car more difficult to steer, which is something you’ll want to avoid as the roads get slick. Protect yourself from carbon monoxide. Carbon monoxide leaks are dangerous at any time, but they are especially deadly during the winter when you will be driving your vehicle with the windows closed. Have your exhaust system checked to make sure no leak exists. Apply the brakes. Besides the seatbelt, your car’s brakes are its most important safety feature. This is especially true in the winter when slippery conditions can make stopping difficult. Before the first snow fall, bring your car to an experienced mechanic to verify that your brakes are ready for the season. Cold winter temperatures mean vehicle maintenance is even more important. By following these simple tips listed above, you’ll be able to ward off winter’s harshest advances, protect your investment and those who ride inside of it! To get everyone prepared for winter safety, I am giving one lucky winner an Emergency Prize Pack including a Thermal Travel Mug, Fleece Travel Blanket, Hand Mitt Ice Scraper and $30 VISA Gift Card! To enter this giveaway, complete any or all of the options listed below. Giveaway ends 1/17. Good luck! We check the car fluids, bakes, and tires. We keep an emergency kit in the car at all times as well as a flashlight. We check our tired and fluids, and make sure we have water and blankets in our cars. I make sure I have some blankets in the trunk, along with a flashlight with new batteries and some bottles of water. We keep it stored in our garage, and also have a first aid kit in it. I make sure the battery is in good working condition and keep an ice scraper, blanket and flashlight in the car. We check the fluids and tires, and then try to stay off the roads when they are bad. We check our tired and fluids. We keep an emergency kit in the trunk, and an extra layer of clothing. We put winter tires on my care and change the wipers and oil. We make sure the tires are good, the batteries are strong and have a flashlight and blanket in the car. We keep emergency supplies in both vehicles. I make sure the wiper blades are good. Keep a small supply of emergency items in trunk. I have a small emergency kit that I keep in the car that I bought on Amazon a few years ago, but that is about it. Check and monitor tires. Warm blankets always in vehicle. I keep a blanket in the car with me, but that’s about it. i change the wipers, oil, and check tire pressure and treads. We have emergency kits and blankets in the car. We add more if we are going on a trip. I make sure that my wipers are good, I have the coolant checked to make sure it is strong enough. I have the air pressure in the tires checked and I check the power steering fluid, and check all the fluids and make sure the battery is good. I get my brakes checked and I stow some water and snacks and warm clothes in the trunk. I change oil and fluid and have tires and brakes checked. Oil change right before winter and new wiper blades. We put in the scraper, have an emergency kit, and I always make sure to have all of our coats. I have an emergency kit. This year we had to replace my battery – thankfully it happened before the winter season really started because temps get REALLY cold and I would’ve hated to have been stranded somewhere in below freezing weather. My mom keeps bugging me to have a blanket in the car so this prize pack would be great 🙂 Thanks for offering the giveaway! To winterize my car I have the battery tested, and I have the tire-pressure checked. I also keep a scraper and snow brush in the trunk, as well as hat and gloves. I usually change the oil, make sure my window scraper is in the car. I check the tires and all fluids! We always have our tires rotated, and oil changed! I have extra clothes and blankets in the car. we keep jumper cables, cat litter & a shovel. also blankets. I change the oil and the wiper blades and check my tire pressure. May need a plow on the front this year! We make sure tires are properly inflated. We also change oil regularly and ensure there is a blanket, flashlight, first aid kit and extra windshield wiper fluid in each car. At the first sign of the engine light coming on, we take it in for an evaluation. I check the air pressure in the tires. I rely on my husband to take care of that. We check wiper blades and tire pressure. We do a full maintenance check and tune up, as well as making sure emergency supplies are in the trunk. I check tire pressure, make sure the battery charger is charged up and in the truck. I make sure all the fluid levels are good and the tire pressure is equalized. Have hubby rotate tires, change oil and make sure I have extra hats and gloves in the car. I got new windshield wipers this year. I keep blankets in my trunk. I stock the car with extra blankets and a shovel. I check antifreeze, put on new windshield wiper blades and add blankets and water to my car. Usually nothing more than checking the washer fluid unfortunately. I always make sure all of my fluids are filled. I just learned that you shouldn’t let your car idle for too long when it is cold out. I make sure that all fluids are full. My husband put snow tires on for me and he changed the spark plugs. With my hubs being a mechanic I’m lucky enough to have him on the ball and he has usually already checked my tires(tread act), made sure I have the winter appropriate windshield wipers and fluid as well as anything else he dreams appropriate done by the first week of winter so I’m blessed to not have to try and remember to do it myself! I do winterize my car by getting the oil changed and inflate the tires. I have my husband check the coolant and antifreeze levels. I hope he does it!! I try to keep my car with new oil as I should too. I have an ice scraper ready to go and extra stuff in the car in case I break down. When I was working early in the morning I had studded snow tires! I get my car serviced and make sure everything is good. I also put in washer fluid that helps de-ice the windshield faster for those days I don’t get out to warm up the car first. I keep a bottle of windex by the front door so that I can easily unfreeze my car doors and locks! I sent the car for a oil chance and check the tires ! I put snow tires on my car for the winter.